Graciousness, warmth, elegance and relaxed conviviality—these are the things we associate with SESAC’s annual awards banquet. This year, the smallest of the performing rights organizations has shown more muscle than ever, with pieces of hits by such top stars as Taylor Swift, Lady Antebellum, George Strait and Keith Urban. But its banquet (11/8) retains its “family” feeling. The cocktail tent was a sea of friendly chatter. Gary Burr greeted Ray Wylie Hubbard, saying, “The last time we saw each other, we were on stage at Radio City singing ‘Happy Birthday’ to Ringo Starr.” And how many of us can say the same? Scott Robinson is all aglow about an upcoming Matraca Berg CD that Dualtone is releasing, which is “twelve years in the making,” he sez. Anna Wilson is pumped about her Countrypolitan Duets album. It has its introduction at the Ryman on Tuesday’s Grand Ole Opry show (11/16). Mingling and munching on the mini ham & biscuits, turkey panini and yummy veggie roll-ups were Dan Hays, Don Henry, Pete Fisher, Peter Cronin, Peter Cooper, Tim McFadden, Tim Wipperman, David Macias, David Ross, Buddy Cannon, Buddy Miller, Steve Moore, Steve Bogard, Dale Bobo, Bill Mayne, Beth Orton and Blake Chancey. Looks we liked? Katie Armiger took first place in a stunning, off-the-shoulder, ruffled ebony cocktail dress. Shannan Hatch was a cutie in a sleeveless silver mini dress. Susana Ross chose a cream-colored sheath. Nancy Shapiro was in sequins. Buddy Miller was resplendent in a multi-hued, patterned jacket. Anna Wilson, as always, was an eye-full in a figure-hugging, wine-colored gown with a colorful shoulder wrap. “What am I, chopped liver?” complained Monty Powell when I complimented Anna. He was a looker, too, wearing a black velvet jacket over a black western shirt with white piping. He was also a trend setter. Clay Myers? Black velvet jacket. Beth Nielsen Chapman? Black velvet jacket. Jim Lauderdale? Embroidered black velvet jacket. Ken Johnson? Navy velvet jacket. We entered a serene dinner tent erected on SESAC’s front parking lot. The dinner tables were draped with gold cloths. Calla lily and orchid centerpieces glowed with votive candles. The salad was a mélange of clementines, manchengo, fennel, raspberries and arugula with drizzled vinaigrette. The main course was pistachio encrusted mahi-mahi, filet mignon, risotto, potato puree and honey-thyme infused carrots. Yum. Chocolate and vanilla mousses with whipped cream topped the banana Anglaise dessert spiked by chocolate biscotti as the irresistible finale. “This year is SESAC’s 80th anniversary,” announced Pat Collins to the applauding crowd. “Eight decades of providing service and dedication. Have a wonderful and entertaining evening: It’s going to be a blast,” he promised. He was right. Lady Antebellum kicked things off with a thrilling performance of “Need You Now.” “Wow!” said Trevor Gale. “That’s all I can say.” He pointed out that SESAC has had an unprecedented year with successes in urban, Latin and bluegrass musics, not to mention Mumford & Sons. If you have not heard that record yet, go out and get it right now. Tim Fink praised attendees Mayor Karl Dean and the Opry’s Pete Fisher for their response roles during May’s flooding. Ray Wylie Hubbard took the stage to do the delightful “Drunken Poet’s Dream.” Ray was one of the Americana music winners, as were Lauderdale, Chapman and Jerry Salley. Country award winners in attendance included Victoria Shaw, Kim Tribble, Brice Long, Blaine Larsen, Cary Barlowe, three-time honoree Monty Powell and Gary Burr. Ben Vaughn, Tom Luteran and other staffers accepted Publisher of the Year honors for EMI Foray. 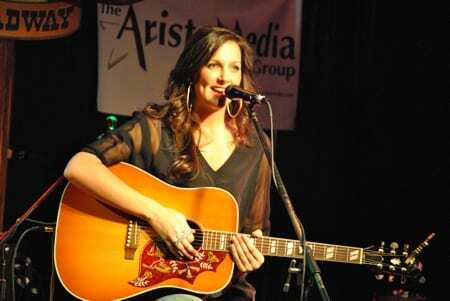 Lady A’s Hillary Scott was named Songwriter of the Year, thanks to her co-writing “I Run to You,” “Our Kind of Love” and the Song of the Year “Need You Now.” I have a feeling that this is a portent of more statuary to come this week. Parents Lang Scott & Linda Davis clapped and beamed. So did Bob Doyle, Robert Ott, Roger Murrah, Rick Carnes, Ree Guyer Buchanan, Ralph Shultz, Drew Alexander, Dwight Wiles & Diana Johnson, Tinti Moffatt, Terry Wakefield, Tammy Genovese, Tamara Saviano, Al Moss, Alan Kates, Carla Wallace, Hank Adam Locklin, Woody Bomar, John Styll, Dana Strong, Elliot Mazor, Scott Siman, Erika Wollam Nichols and Giles Goddard. Most SESAC attendees were looking at the event as the first of a trio of awards galas this week. We party professionals have already been hard at work. For us, the round of bashes began on Sunday (11/7) with the Music City Walk of Fame inductions of Kris Kristofferson, Mel Tillis, Jimmy Dickens, Rascal Flatts and the late Bobby Hebb and Eddy Arnold. It was a lovely, balmy afternoon. Many of the same stars gathered at the Ryman that evening (11/7) for the sold-out, 50th anniversary concert for Tootsie’s Orchid Lounge. In addition to Mel, Jimmy and Kris, I spotted Lorrie Morgan, Randy Houser, The Grascals, Mandy Barnett, Joanna Smith and Tootsie’s owner Steve Smith. 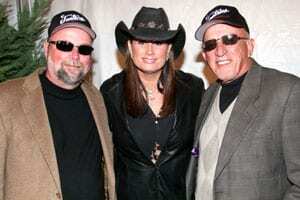 Also on the concert bill were Terri Clark, Colt Ford, Mark Chesnutt, Ronnie McDowell and Dean Miller. 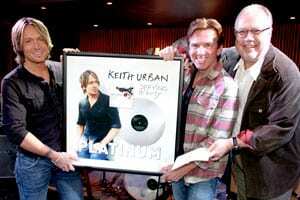 The next day, we headed back downtown (11/8) for the album-release party for Get Closer by Keith Urban at the Hard Rock Café. But before we officially did that, Mike Dungan gave the star and producer Dann Huff a Platinum Record award for Defying Gravity. Ron Stuve, Ron Huntsman, Donna Hughes, Dan Hill, Darrell Brown, John Huie, Kyle Young, Steve Buchanan, Phyllis Stark, Teresa George, Mary Ann McCready, Lisa Harless, Susan Stewart, Pat Higdon, Autumn House, (the ubiquitous) Jeff Walker, Nicole Kidman, Ansel Davis, and Vernell Hackett applauded. I told Deborah Evans Price that I was the first person to buy her book, The CMA Awards Vault, at the CMA office. And I was. Kay West was also there, on the hunt for a sighting of Jake Gyllenhall. Speaking of movie stars, whose bright idea was it to schedule the premiere of Country Strong at the exact same time as the SESAC banquet? Jimmy Carter, Cindy Watts and a number of other media mavens were working the red carpet in Green Hills (11/8). They were rewarded by appearances by Gwyneth Paltrow, Tim McGraw, Tobey Maguire, Faith Hill, Luke Bryan, Sara Evans, Little Big Town, Jerrod Niemann, Joey + Rory, Kix Brooks, Dierks Bentley, Mark Collie and Steel Magnolia. Oh, one more thing. On that same afternoon at The Stage on Broadway (11/8), the Aristo Center Stage Party was staged. Ty Herndon, Amber Hayes, Ashley Gearing, Daisy Mallory, Rachel Holder and D.J. Miller were booked, with The Country Vibe’s Becca Walls and Chuck Long doing the emcee duties. So don’t come whining to me about three straight nights of awards. The party boy had LOTS of gigs to pay attention to before the rest of you were on the job.